Home » News » Warehouse News » Domo arigato, Mr. Roboto! Having trouble finding workers for dull, dangerous, or dirty tasks? For more and more DCs, the answer is a robot. Collecting boxes off a conveyor belt and stacking them neatly on a pallet can be boring, backbreaking work. So when robotic palletizers began to show up in warehouses some 15 years ago, their arrival was hailed as a way to free up human workers to handle more complex tasks around the DC. Fast forward to 2015. The world of warehousing and distribution robotics is now on the verge of another big change, driven by advances in three of the enabling technologies that are necessary for a successful industrial robot deployment. 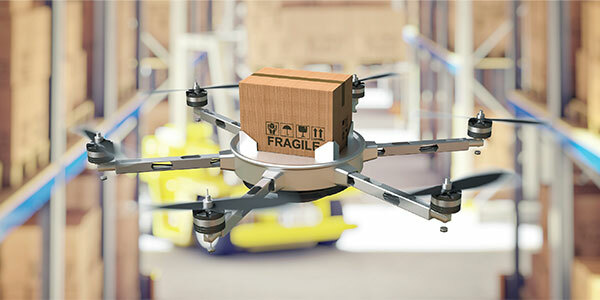 In recent years, engineers have improved robotic intelligence, providing sensors and data to drive more complex applications; robotic mobility, allowing robots to move to the appropriate location in a large warehouse; and robotic vision, using three-dimensional perception to locate specific objects in a cluttered environment. Designers are taking advantage of these new tools to bring robots to parts of the logistics operation where they haven't been seen before. Counting manufacturing as well as distribution, an estimated 236,000 robots are now in use at American factories, placing the U.S. second only to Japan in robot use. And that number is growing fast, according to the Robotic Industries Association (RIA). A total of 22,427 robots valued at $1.3 billion were ordered from North American companies in the first nine months of 2015, a jump of 6 percent in units and 9 percent in dollars over the same period last year. There's a platitude among engineers that the best applications for robots in the workplace are the "4D" jobs; tasks that are too dangerous, dull, dirty, or dumb for human laborers to perform efficiently. That applies in the DC, too, where managers first brought robotic platforms like automated storage and retrieval systems (AS/RS) and automated guided vehicles (AGVs) into their operations to enable high-density storage and to help ease a worker shortage. "(Items needed to fill orders) are getting moved to people, so people can concentrate on higher-level processes and value-add jobs," said Earl Wohlrab, robotic and palletizing systems manager for Intelligrated, a Cincinnati-based systems integrator. "There are lots of peripheral operations that people can be doing, aside from just pushing a cart around." The trend will gather steam as labor becomes increasingly scarce and as the technology used in robotic systems advances, Wohlrab predicts. Still, there are many tasks where humans will always outperform robots. "There's nothing better than a human picker," Wohlrab said. A human has no trouble distinguishing between items that are "the same object but a different flavor," he points out, but you can't make that assumption with machines. "That's intuitive to humans, but it needs to be taught to automated platforms." That ability to handle variability in warehouse work is one of the features that distinguish a true robotic system from one that's merely automated. As part of a complex system, robots can add flexibility to automation, a crucial ingredient in the age of omnichannel fulfillment, said Jeremiah Miele, manager of research and development at Genco, a Pittsburgh-based third-party logistics specialist (3PL) recently acquired by FedEx. Most warehouses were designed to pick and ship pallets and cases, but as the e-commerce revolution takes hold, retailers find themselves filling more and more orders for individual items or pieces. As a result, fulfillment centers today are handling a greater portion of small bins, bags, and boxes than they did in the past. "(Robotic intelligence) is even more important in logistics than in manufacturing, because change is happening constantly, as opposed to maybe quarterly or annually," Miele said. Given that reality, it's probably no surprise that designers at Genco are looking beyond the autonomous mobile robots of the type built by Kiva Systems (now known as Amazon Robotics) to more creative robotic platforms, such as indoor flying drones. "We're really interested in drones right now; they have untapped potential as a platform for delivering robotic (capabilities) within a DC," Miele said. "There's also a very large enthusiast community to provide expertise. But we haven't seen them used before besides scanning buildings and yards. Drones are just a platform for mounting intelligence; with a vision system and enough time, we can build anything." Another robotics firm experimenting with new platforms is Clearpath Robotics, a Kitchener, Ont.-based company that in September, unveiled a self-driving warehouse robot called Otto. Designed for intelligent heavy-load transport in industrial environments, each Otto platform uses laser-based "lidar" scanning to sense and map a building floor, then uses onboard intelligence and cloud connectivity to operate in fleets of eight to 12 mobile robots. Like tiny Google self-driving cars, the pallet-shaped Otto robots can transport loads of up to 3,300 pounds and cruise at 4.5 mph. The system was recently chosen by GE for a warehouse pilot program, according to Simon Drexler, Clearpath's director of indoor industrial solutions. As more robots take their place inside DCs, warehouse managers increasingly need to consider how the machines will fit in with their human associates. "It's not always about labor displacement, but people using robotics as a tool, a force multiplier," said Genco's Miele. "People (are) continuing to do their jobs, but now they can have five or six robot friends helping them." Standards for safely deploying robots in human environments are finally catching up with this trend, says Lew Manci, vice president for engineering at Crown Equipment Corp. in New Bremen, Ohioâ?¬. In January, the latest set of robotic safety guidelines, ANSI R15.06, went into effect. The engineering standards, which capped years of efforts to harmonize U.S. and European regulations, could open up new markets for industrial robots by clearing the way for robots to work alongside humans, Manci said.